Airmax unveiled its new PondSeries floating fountain product line. 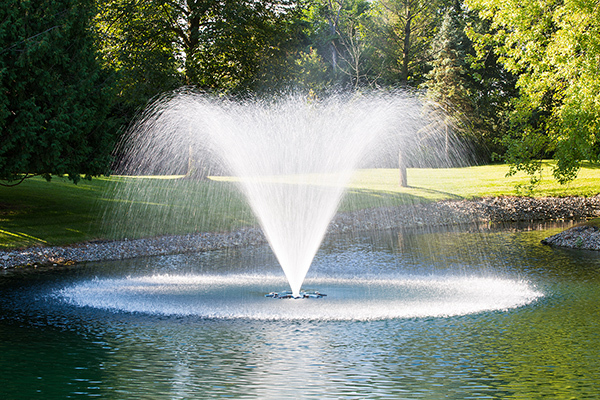 The new PondSeries fountains feature 0.5-, 1- and 2-horsepower units that showcase a lightweight, drop-in design, three spray patterns and no oil or seals to change. “When we set out to develop the PondSeries fountains, we wanted to pack them with high-quality features that both pond owners and professional installers alike would appreciate,” said Sean Diamond, the company’s head of engineering. Traditionally, floating fountains had to be pulled out the water and taken back to the dealer’s shop for cleaning and repair. The PondSeries patent-pending design allows an Airmax professional installer to completely repair the products at pondside. “We tried to design the PondSeries through the eyes of the field installer, so we wanted to design something where repairs and maintenance could be done under an hour and right at the pond’s edge. That’s why you only need a few tools and one person to make any repairs necessary on these units,” said Jason Blake, Airmax’s owner. To support the introduction of the PondSeries line, the company has rolled out a product support program that includes a demo road show, a new website and new videos. Airmax representatives will be traveling across the U.S. visiting distributors to demonstrate the functionality of each fountain. Additionally, Airmax has rolled out a new website designed to be more user friendly and to allow distributors to have better access to images, promotional materials, SDS sheets and new videos of the PondSeries fountains running both day and night, according to the company.